The circuit is the same as the one used in Arduino and HC-06 (ZS-040) except the addition of a LED + resistor connected to pin D12. I used a 220 ohm resistor because that is what I had to hand but similar values will be OK.
Based on ohm’s law; using a source of 5V, a green LED with a forward voltage drop of 2.2v and a forward current of 20mA a 150 ohm resistor is recommended. So any value from 180ohm to around 680 ohms will be OK. The sketch receives data from the Bluetooth module via software serial. It then checks the data for “ON” and “OF” commands. When “ON” is received the LED is turned on and when “OF” is received the LED is turned off. To ensure that data is received correctly the data is surrounded by start and end markers. This example uses “<" and ">“. I use the function recvWithStartEndMarkers which was posted on the Arduino forum by Robin2. I simply copied the function and did not need to change it. The recvWithStartEndMarkers() function takes at the data received from the serial connection and copies anything it finds between the start and end markers to the receivedChars variable. When it has found something it sets the newData variable to true. In the main loop we keep calling the recvWithStartEndMarkers() function until newData has been set. When newData is True we know we have a new command so we call parseData() to deal with it. Inside parseData() we reset newData to false and the process continues. 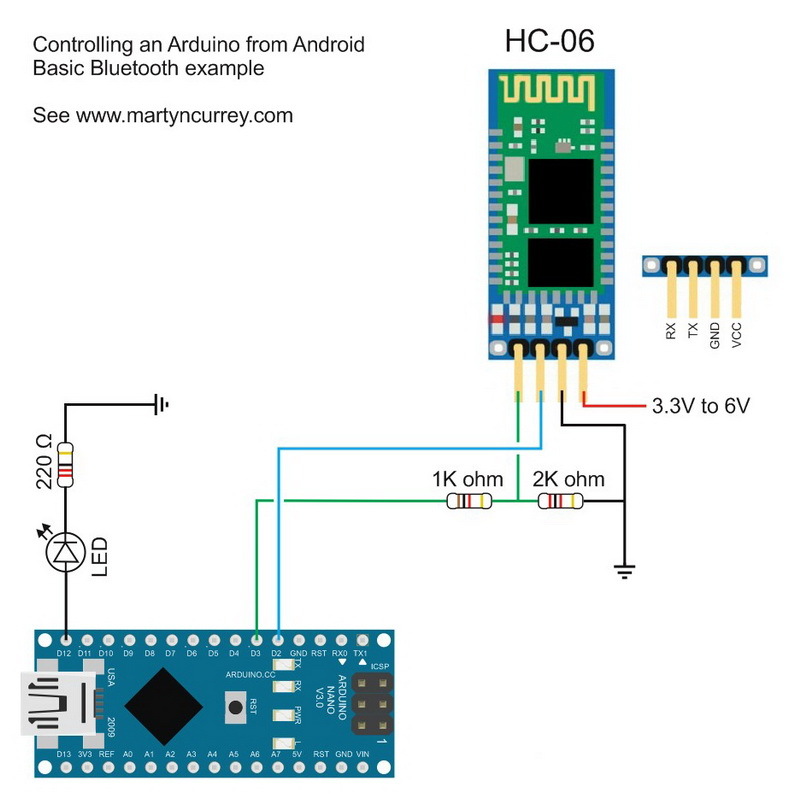 // Connect the HC-06 TX to the Arduino RX. // Connect the HC-06 RX to the Arduino TX through a voltage divider. // The default baud rate for the HC-06s I have is 9600. Other modules may have a different speed. 38400 is common. 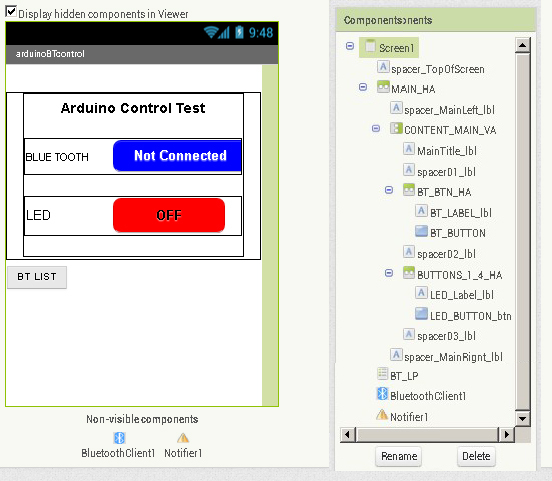 I created the Android app in MITs app inventor. This was fairly easy once I had figured out how to use Bluetooth. The app is very basic, it simply sends commands. 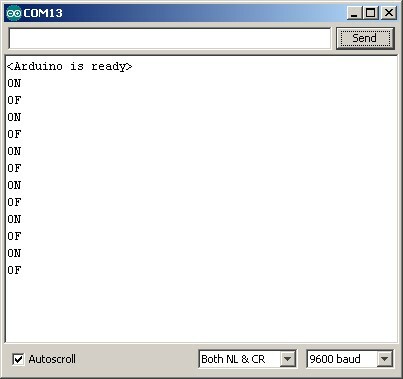 There are no checks to see if the Arduino has actually received the commands or not. The screen is also very simple; it has a button for connecting to Bluetooth and a on/off button to control the LED. The app uses a ListPicker to store the available Bluetooth devices which is not displayed on screen. It is initiated from the connect button. If Bluetooth is on and there isn’t a current connection the paired Bluetooth devices are copied to the Bluetooth pairedDevices List. If the list has at least 1 item the contents of the list are copied to the ListPicker. The ListPicker is then activated to allow the user to select a Bluetooth device. I use the pairedDevices list so that I can count the number paired devices. I could not find a way of doing this when using just a ListPicker. If the list is empty an error message is displayed saying there are no paired devices. 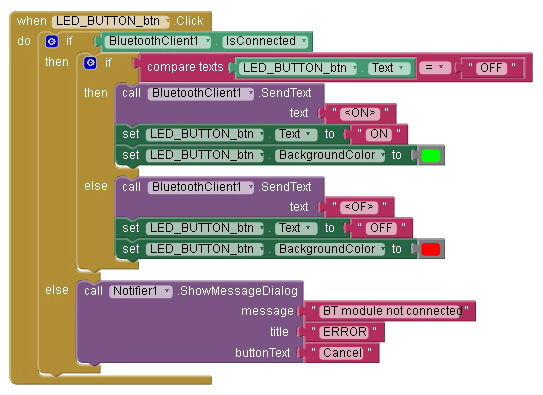 Block 2, BT_LP.AfterPicking handles the List Picker after the user has selected one of the paired Bluetooth devices. It takes the selected item and tries to connect. If successful the text on the Bluetooth button is changed to “Connected”. If a connection cannot be established an error message is displayed. Once a connection is established the app waits for the LED button to be pressed. Block 4, LED_BUTTON_btn.Click, handles the LED button. By checking the button text we can determine what command to send. If the text says “ON” then the LED is on and we need to turn it off so we send an “OF” command. If the text says “OFF”, the LED is off so we send an “ON” command to turn it on. The actual commands are “<ON>” and “<OF>”. The button text and background colour are updated to reflect the new LED status. 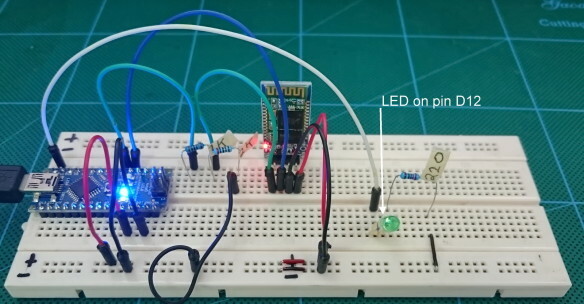 An error message is displayed if the LED button is clicked and there is no active connection. Download the zip file containing the Arduino sketch, the ardiunoBTcontrol app and the appinventor aia file. In part 2 we add 2-way communication and the facility to control the LED from the Arduino as well as the app. 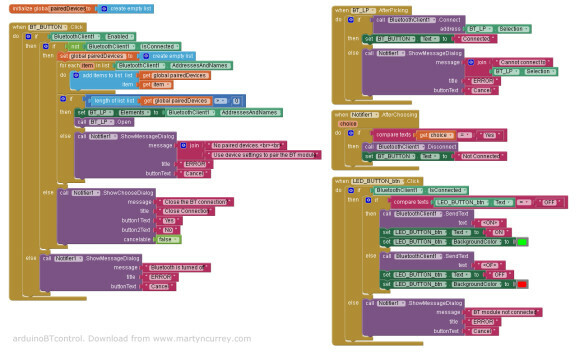 This entry was posted in Android, app inventor, Arduino, Bluetooth and tagged HC-06 by Martyn. Bookmark the permalink. Have a look at http://www.martyncurrey.com/arduinobtcontrol/. This is the next step and includes sending data from the Arduino to the app. 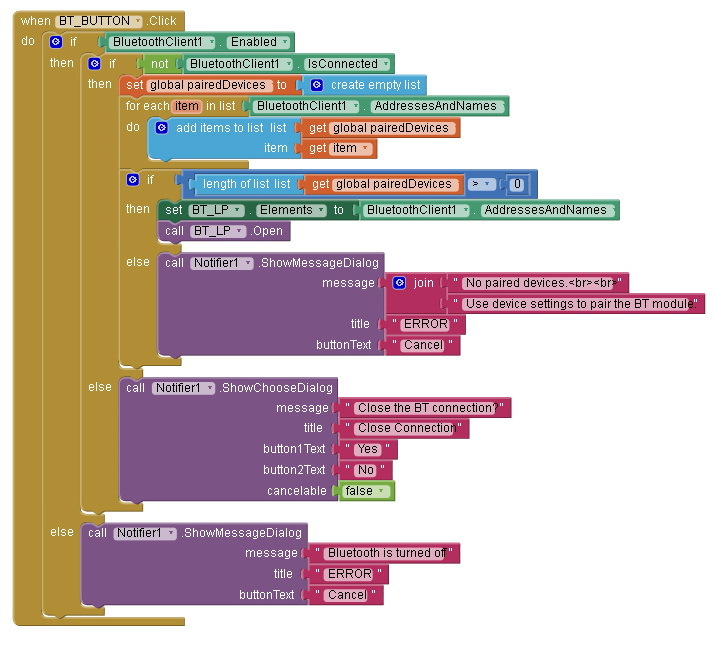 The arduinoBTcontrol Android app has 3 command buttons that wait for an acknowledge signal from the Arduino before resetting. The way I do it is very basic but should be a good place to start. dear Martyn, your simplified illustration and work is really appreciable, i have made this circuit and its working completely. but i have one query that can we made HC-06 as auto connect after we paired it first time ? actually its really annoying that every time we have to connect the phone to HC-06, likewise wifi can we do auto connect, please correct me and guide. thanks for your awesome work . yes this is possible although I do not have an example to post at the moment. The simplest way would be to change the address used in the “BluetoothClient1.Connect” block. At present the address comes from the Listpicker selected item “address BT_LP.Selection”. Change this to the address of your HC-06. To take this further, I would allow the user to connect as per the above then add the facility to remember the paired & connected address. Then on start up, if there was a remembered address try to connect. I will do and let you know. Thank you so much. well thanks for your guidance….i have tried as you described and it works flawlessly. However, this is not working and I don’t know what the issue is. The problem is you are still using the listPicker.AfterPicking event to connect. This means the list picker still needs to be used. I would also suggest adding checks to see if blue tooth is turned on and the bt address is in the list of paired devices otherwise you may get system error messages. Sill trying, thanks for the advice. This saves the address of the connected device and tries to connect when the app is next started. Now, the phone receive the status of the LED and update the LED button status (on or off) , but the app freezes if it doesn’t receive anything (phone is out of range). I get a pop up message saying ” Error 516: Unable to write: Broken pipe ” and I can’t work with the app any longer. Unfortunately app inventor doesn’t report when the bluetooth connection is lost. The only way I have found to get around this is to send regular “hello” signals from one device and then send a reply from the other device. If I get a reply then the connection is still active. If the connection is not active you get an error message. You can trap the system errors using the “when Screen1.ErrorOccurred”. One of the values this gives you is the errorNumber so you can test for errorNumber = 516. Thank you so much, it was really helpfull. Hey! What do i have to do with that “if –> then”? I mean, i have the same problem and i’ve created the block: When screen1.ErrorOcurred: do: if “get(errorNumber) = 516″ then… then what? sir I’m getting an” error 516: unable to write:[JSR82] write: write() failed. what should I do. BT is connecting to app but led is not responding. I have done a program with sliders in app inventor 2 to control RGB led strip and when i move the slider to change the color of the RGB led strip in serial monitor i get only symbols in serial monitor of the ardruino and not numbers. what is the problem? 2. the format of the data being sent. It could be you are sending actual values (1,2,3 etc) and then treating them as ascii on the Arduino. See http://www.martyncurrey.com/arduinobtcontrol/. I created my own sliders but you can use the built in sliders exactly the same. what error message are you referring to? I would like to ask, at the block 1, where did you get the global pairedDevices? I would like to do a similar program which control more led. If I want to do that the led is only on when the user pushes the button than should i use the “when led_button.touchdown”? global pairedDevices is a global list – see “the app has 4 blocks” image. If you want the LED to come on only when the button is held down then you would use the touchdown and touch up events. Touch down to turn on the LED, touch up to turn off the LED. What a silly I am, now I see it. Can I ask you something more? I did what you suggested, and it works fine, but can I make the platform somehow multi touch? I mean how can I setup that I want to turn on two leds on the same time? Do you mean have more buttons to control more LEDS? If yes then you just need to extend the app and the commands used. In the app add extra buttons; some like LED1, LED2, LED3 etc. In the Arduino sketch, in the parseData function check receivedChars for the commands and set pins HIGH or LOW accordingly. As the commands get longer it would better to use strcmp. can i use this for more LED? Sir, thankou very much for your examples, I just bought an HC-06 and followed your basic setup page, works flawlessly, now I am trying this one but I am pleased to have found so much infos in one place. Thank you sir for sharing this article its quite helpful. how to get the call BT_getNewData?? There is no BT_getNewData in this example. For receiving BT data on the Android device see part 2 and part 3. I may have missed the instructions, but how do I install the apk file on my phone once I downloaded it from your site please Martyn? Ah wait, Dr Google to the rescue. I found a way on stackexchange, where it was suggested I email the apk to my Gmail, open the mail on the phone, download the apk from the email. Then it recognised it as an apk and offered me the choice to install, which I did…. works a treat, thanks for this tutorial. I would normally copy the apk using a usb cable. After it is copied I using a file manager app to click on the apk and install it. You need to allow install from untrusted/unknown sources. I have some problems with my bluetooth connection based app. The app is working well but after a minute I get a message from the app saying ” Error 516: Unable to write: Broken pipe ” and I can work with the app but bluetooth module disconnects from my mobile. I think it could be a problem related to the baud rate, I’m using Serial.begin(38400) in my Arduino code and the bluetooth module is also configured at 38400 b/s but i don’t know, my app sends 2 bytes number (two “Call BluetoothClient send1byteNumber” one after another) and maybe the baud rate is too much. The baud rate is used for the communication between the Arduino and the Bluetooth module only. The baud rate used by the BT module to talk to the mobile phone is automatic and handled by the phone. You cannot change this. The Broken Pipe error means you have lost the connection. Are you moving around or are you using the module in a wireless noisy environment? You can trap the errors with the Screen1.ErrorOccurred block. Test for error 516 and then try to reconnect. Or have a popup that says the connection is broken and would you like to try and reconnect. Can u please get me block for 4 nos botton for BT to on off for 4 nos led. Genial, Muy buen articulo, mil gracias.